Education is not as simple as everyone thinks, as everyone wants the best from teachers or educators. Students’ under-going teachers’ education training need to be competitive, globally aware and empathetic. Teacher trainees must appreciate and value their education trainings and feel passionate to be selected for the training program. Though the news of the closure of about 10 IPGs recently became the talk of the town, the need to attract the best and brightest minds to the teaching profession are still the priorities. With the rise of so many modern improvised educational theories among of the likes of the 21st century teaching skills, from teaching and learning to facilitating, the call for ensuring innovation revolution beyond 2016, innovative teachers are sure in demand. Are we very sure and confident enough that the newly-trained teachers from the IPG or the universities are readily prepared to face the education world? What should the profile of a Malaysian teacher be in the 21st century? The panel of interviewers for the teaching program held this week might spot and get the best and brightest into the profession that moulds our future thinkers. Teaching now is facilitating curiosity and critical thinking skills. Teacher trainers have the task to mould and develop students for the continuous changing world in which they will have to face and survive later. Not many are born to be teachers, and not many are willing to be trained rigorously. No one can be said to have more empathy, the ability to transfer knowledge better and engage classrooms more easily in comparison. In past years, many retrenched professionals applied to become teachers in the KPLI and DPLI program as studies said that they will perform better rather than recent school leavers or undergraduates who don't know what to do next. Studies showed that we must quit trying to prepare individuals who are unsuited to being teachers in any case and concentrate more energy on uncovering the endless teaching ability that must be out there in the workforce today, individuals who may be good at their current job but dissatisfied. These are the general population we need to draw in to educating. Despite the fact that many teachers know it is their reason for living from an early age, many don't. Educating is not for the individuals who need long occasions or don't comprehend what else they will do with their lives. Educating is with the most remunerating vocations on offer. It is a vocation of unbelievable fulfillment and boundless learning. It requires perpetual interest and no day is the same. There is no murmur drum day at the workplace as an educator. 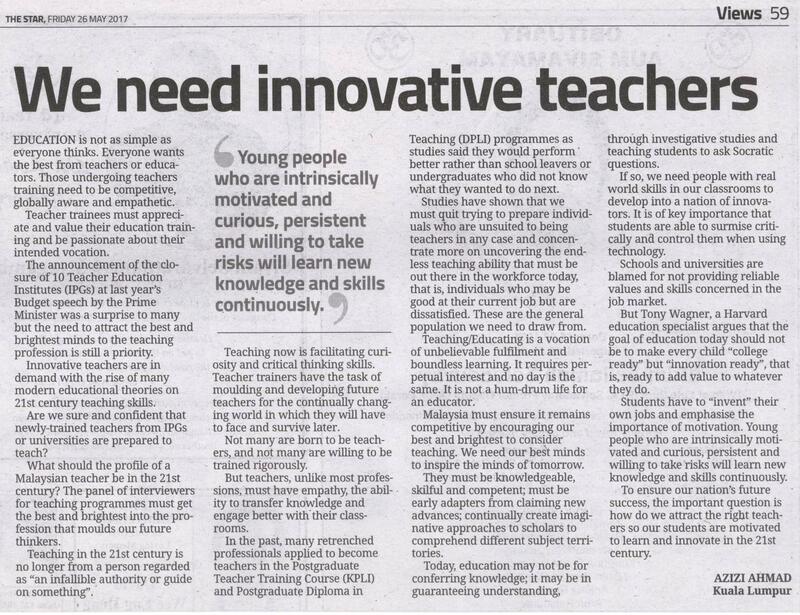 Malaysia must ensure it remains competitive by encouraging our best and brightest to consider teaching. We need our best minds to inspire the minds of tomorrow. Teachers’ today compelling reason should think to such an extent more than their subjects. They must be knowledgeable, skillful and competent; must be early adapters from claiming new advances; continually create imaginative approaches to scholars to comprehend different subject territories. Today educating may be not over conferring knowledge; it may be over guaranteeing understanding through investigative studies and Socratic considering abilities. We need people with real world skills in our classrooms if we are going to develop into a nation of innovators. It is so true that current students a greater amount learning over at any point but frequently don't recognize the thing of the data toward their fingertips. There has been no parallel explosion of thinking. It is key importance that students are able to surmise critically and control them when using technology. Schools and universities are blamed for not providing reliable values and skills concerned in the job market. Wagner, a Harvard education specialist argues the goal of education today should not be to make every child "college ready" but "innovation ready”, ready to add value to whatever they do. Students have to “invent” their own jobs and emphasize the importance of motivation. Young people who are intrinsically motivated and curious, persistent and willing to take risks will learn new knowledge and skills continuously. To ensure our nation's future success, the important question is how we attract the right teachers in order to ensure our students are motivated to learn and innovate in the 21st century. Debates about whether studying teaching online is just as effective as face-to-face lectures and tutorials are questionable. If studying teaching online helps attract talented future teachers then it is surely a method that should be considered. With progressively extreme budgetary times in the next few years, maybe somebody must realize to make the switch into teaching.